On 26 September, Times Higher Education (THE) presented the results of its World University Rankings 2019 in which it evaluates the 1250 best universities in the world. As in the 2016, 2017 and 2018 editions, the URV has been ranked in the 401-500 band of the list. The THE World University Rankings applies standards to the principal mission of a global research university and is based on a combination of thirteen indicators corresponding to five main areas, weighted as follows: teaching (30%), research (30%), citations (30%), internationalization (7.5%) and transfer (2.5%). The URV has improved in practically all areas: in teaching it has risen from 22.2 to 24.2 points and in research it has increased from 17.2 to 20.2. It has also improved by almost two points in internationalization, from 47.7 to 49.1, and in transfer it increased from 34.5 to 36. 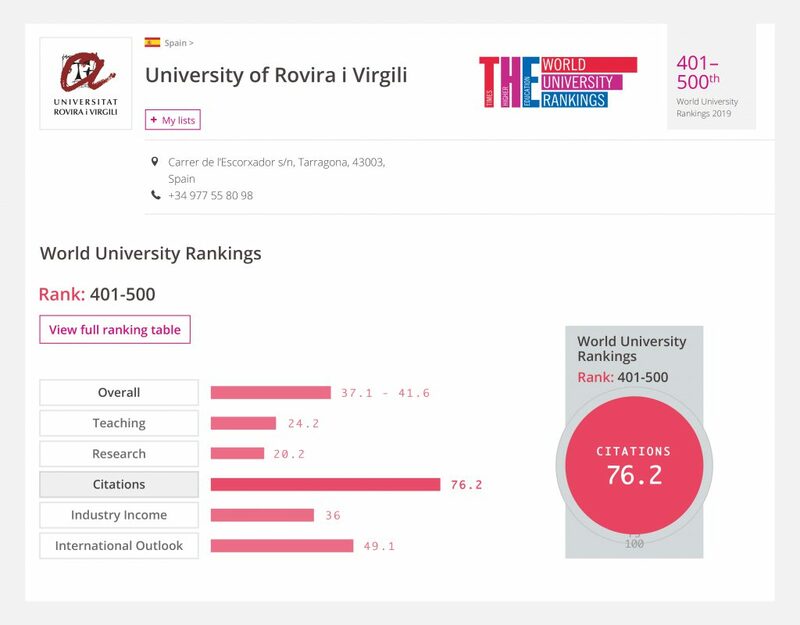 The highest score is for citations, the impact of researchers’ publications, where the URV has scored 76.2 points, albeit two decimal points lower than last year. This indicator analyses the influence of research by calculating the number of times that a publication has been cited by other researchers around the world. The URV is in sixth place out of the 29 Spanish universities that appear in the list, in the same position as the Universidad Complutense de Madrid. Both institutions are among those universities ranked in the positions 401-500 in the world. Both are ranked between 401 and 500 in the world because the THE World University Ranking does not give specific numerical positions to the 100 universities in this band. Three Catalan universities head the list of the best universities in Spain: the Universitat Pompeu Fabra (135), the Universitat Autònoma de Barcelona (145) and the Universitat de Barcelona (201-250). The 2019 edition of the ranking highlights the dominance of British and American universities. The top five positions are occupied by Oxford, Cambridge, the California Institute of Technology, Stanford University and the MIT. This year’s ranking has representatives from 86 countries, including, for the first time, higher education institutions from Iraq, Jamaica, Nepal, Tanzania and Kazakhstan.